The 71st Golden Globes kicked off the award season yesterday evening and as always I loved checking out the celebs walking the red carpet (and photobombing it would seem) and how they've styled their hair. 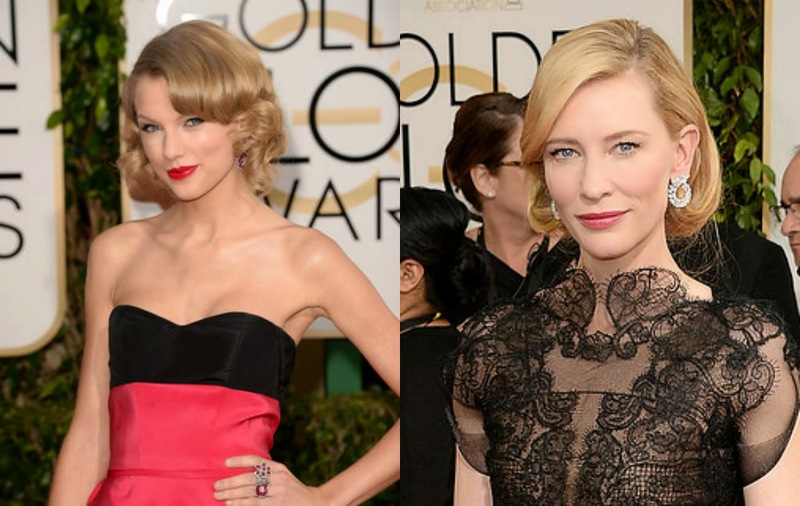 It seems shorter hair is definitely going to be popular this year, with celebs such as Jennifer Lawrence (LOVED the lipstick) looking stunning with her short crop, and Cate Blanchett and Taylor Swift cheating the shorter style look with faux bobs. If you fancy trying this look, keep reading as I'm planning to pick some of my favourite Golden Globes looks and recreate for you. Up do's we voluminous and kept textured. I loved Amber Heard's hair and her outfit worked so well against the relaxed hair and low-key make up. Even though her hair is completely off her face it doesn't look too harsh and the colouring suits the styling - love those earrings also! Side swept hair showed no signs of leaving the red carpet with Sandra Bullock going for a gorgeous side ponytail, and Olivia Wilde being one of many celebs to wear her hair curly and over one shoulder. Was a bit disappointed with Kelly O's hair, I'm not overly keen on the shorter look and the wet look style only highlighted the colour which isn't looking great at the moment. I miss lovely lilac curls and amazing up do's Kelly! Can we also just take a moment to gaze upon the beauty that is Kate Beckinsale?? She looked incredible. The dress is perfection, her hair looks great and her make up, as always, is flawless. Little bit in love!